What does it mean to ‘sweat onions’? So, when directions say to 'sweat' the onions, it means to cook until the water content has cooked away and they are at the point where they will begin to brown. One teaspoon of onion powder = 1 Tablespoon of dried onions. Either one is equivalent to about 1/3 cup of chopped onions. The warmer the climate, the sweeter the onion. One pound of onions contains about 175 calories. Use raw or cooked onions to season stews, soups, tomato sauces or cooked vegetables. Small pearl onions make a great side dish when seasoned with thyme. Enjoy onions on their own stuffed and baked. Stuff onions with chopped vegetables and rice or bread crumbs. Add raw onions to salads or fresh vegetable trays. Include onions to add crunch and flavor to dressings, relishes, or sauces. Onions may be eaten raw or cooked. Onions should be peeled before preparing, except when baking. Onions may be boiled, braised, baked, microwaved, or sautéed. Onions not only provide flavor; they also provide health-promoting phytochemicals as well as nutrients. Onions contain quercetin, a flavonoid (one category of antioxidant compounds), and allium. 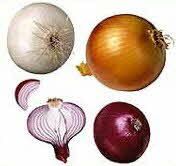 SELECTION - Most onions are sold loose by the pound, although some types are sold in bags or small boxes. Look for onions that feel dry and solid all over, with no soft spots or sprouts. The neck should be tightly closed and the outer skin should have a crackly feel and a shiny appearance. Onions should smell mild, even if their flavor is not. Avoid selecting onions with green areas or dark patches. STORAGE - Onions should be kept in a cool, dry open space away from bright light. Onions do best in an area that allows for air circulation. Because onions absorb moisture, do not store onions below the sink. Also, do not place onions near potatoes because potatoes give off moisture and produce a gas that causes onions to spoil more quickly. Spring/summer onions usually store for about two weeks and storage onions for about three to four weeks. VARIETIES - Onions came in a variety of sizes, colors and shapes. They are often broken down into three categories: spring/summer, storage, and pearl onions. Spring/summer onions are grown primarily from fall to spring in warm weather areas and have a soft flesh and a mild or sweet taste. These varieties are generally shipped right after harvesting. Storage onions have a firm flesh, dry, crackly outer skins and have a pungent flavor. After a brief period of drying, these onions are stored for several months before shipping. Pearl onions are often called white onions and are densely planted to make the onions smaller. There are no nutritional differences among these onion types. Onions also come in three colors — yellow, red, and white. Approximately 88 percent of the onion crop is devoted to yellow onion production, with about 7 percent red onions and 5 percent white onions. The red onion, with its wonderful color, is a good choice for fresh uses or in grilling and char-broiling. White onions are the traditional onion used in classic Mexican cuisine. They have a golden color and sweet flavor when sautéed.